Monday, 14 March 2011 for 1 night. Showing 3 hotels. Imperial Aryaduta Hotel & Country Club situated in the heart of Lippo Karawaci, a modern satellite city West of Jakarta. 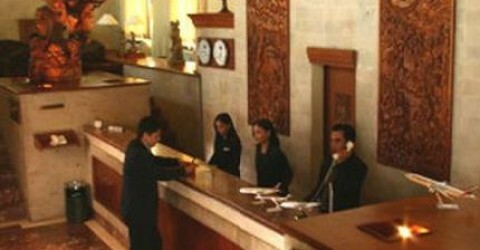 Approximately 45 minutes drive from the Soekarno Hatta international airport and the capital city of Jakarta. All rooms and suites are medium in size with a modern style. Features complete in room amenities. Deluxe room decorated in contemporary Indonesia design, overlooking golf course OR courtyard garden. Palem Cafe serves local and international cuisine, open for breakfast, lunch and dinner. Gardenia restaurant with an overlooking view of pool and cabana serves Italian cuisine. Parrot Garden restaurant serves Oriental cuisine, including dim sum. Hokkaido restaurant serves Japanese cuisine. The Lounge Bar, RJ Sport Bar and Grill, Laguna Bar and Restaurant, Pool bar and Boston Deli are also available in the hotel. Lobby is big in size with extensive sitting area.